The athletic competitions, called by the Romans “certamina graeca” because of their origin, were introduced for the first time in Rome by Marco Fulvio Nobiliore in 186 BC, but were held only 100 years later by Sulla in 80 BC to celebrate the victory over Mithridates. Welcomed by Augustus, Caligula, Claudius and Nero, they were established, however, only in 86 AD, when the Emperor Domitian opened the Capitoline Agon (competition in honor of Jupiter), which was held every five years; this kind of event included, besides the gymnastics, also music and poetry competitions (which were held in the Odeon, built on purpose near the Stadium), following the example of Greek competitions. The program for the races held in the stadium was similar to one of the ancient cycle: in fact, it consisted of running, wrestling, boxing, pankration (from the greek ” pankrates”, where everything was permitted except biting and scratching) and pentathlon. Pentathlon, which was the most important among the races, consisted of five tests: the javelin and discus throw, the long jump, the stadium race, the wrestling match. 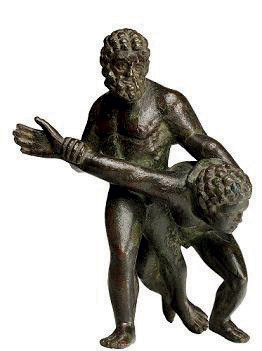 From the very beginning, The Romans preferred boxing and pankration, which were violent and brutal sports. 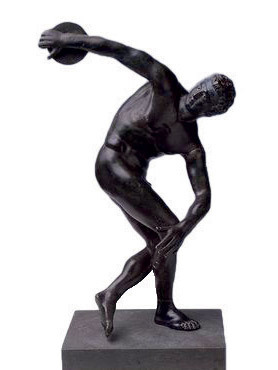 The athletes were generally professionals with Greek or Eastern nationality, competing not only for money, but also for the honors they received; sometimes, however, also ordinary citizens took part to the races, whose victories granted them higher social ranks. The social status of the athletes was not as shameful as the one of the gladiators and Venatores; as a matter of fact, they were often rewarded with the Roman citizenship in case of victory, or they obtained tax privileges or exemption from military service. The athletes gathered in associations, which facilities such as gyms, archives and curiae: the curators of the games gathered there to organize competitions and to establish awards and honors.